Heat moves throughout the home to fill the areas that are cooler. In the winter, this means that air you're paying to heat tries to make its way outside, while in the summer hot air from the outside wants to move into the home. If your home has air leaks or insufficient insulation, the flow of hot air will cause you to experience uncomfortable rooms, uneven temperatures throughout the house, and high heating and cooling costs. However, upgrading your home with new insulation can help solve these problems and reduce your energy costs. Comfort Services, Inc. are your local insulation experts, providing blown-in and rigid foam insulation to turn your home into a comfortable, energy efficient space. If you want to upgrade your home's insulation, call us today at 1-855-800-2275 or click below to get started. We offer free estimates in Aberdeen, Pinehurst, Southern Pines and throughout the surrounding areas. If you've had problems with an uncomfortable home, difficulty getting even temperatures, or high energy costs, the experts at Comfort Services, Inc. can help. Our complete insulation solutions will solve your heating and cooling problems and ensure you have a comfortable, energy efficient home. Comfort Services, Inc. proudly services Pinehurst, Southern Pines, Aberdeen, Chapel Hill, Garner, Apex, Durham, Fuquay Varina, Fort Bragg, Fayetteville and throughout the nearby areas. 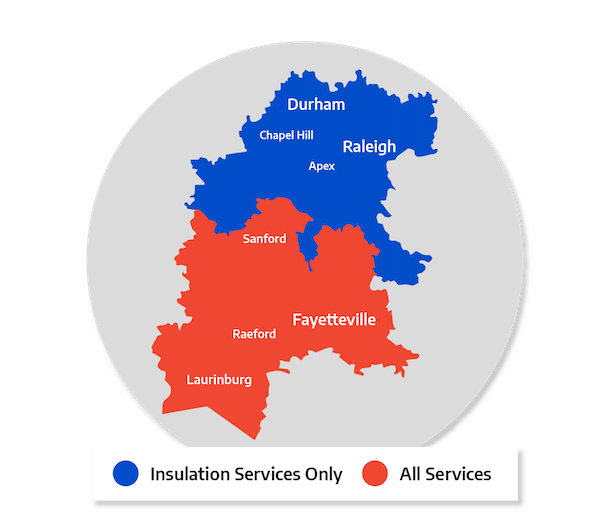 If you are interested in upgrading your existing insulation or would like new insulation installed, call us today at 1-855-800-2275 for a free estimate!